Whisk the egg yolks in a bowl, then add the vinegar and salt, whisking to combine. Gradually add about half the oil, very slowly at first, whisking continuously for around 3 to 5 minutes, or until thickened. Continue to gradually add the remaining oil, whisking continuously. Add a squeeze of lemon juice to taste. Fold in the dill. If it is too stiff add a few drops of water. Fold smoked salmon squares on top of the buttered bread and place a disc of egg on top. Add a few prawns and top with mayonnaise. Put a skewer through the middle to secure the sandwich. 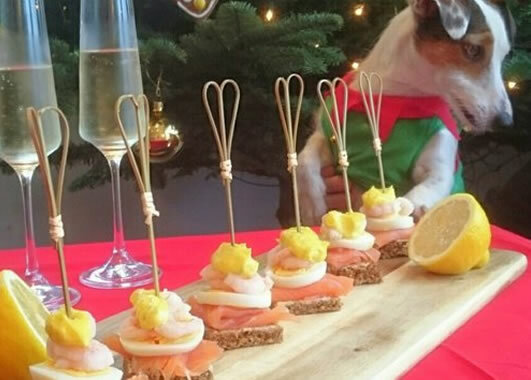 Goes very well with a glass of festive fizz !